Updated Tuesday, May 2, 2017, 6:52 p.m. EDT: Michael Slager pleaded guilty Tuesday to violating Walter Scott’s civil rights. There’s only one thing: Slager has not accepted responsibility. The Department of Justice will hold accountable any law-enforcement officer who violates the civil rights of our citizens by using excessive force. Such failures of duty not only harm the individual victims of these crimes; they harm our country, by eroding trust in law enforcement and undermining the good work of the vast majority of honorable and honest police officers. Former North Charleston, S.C., Police Officer Michael Slager is expected to plead guilty to violating the civil rights of Walter Scott, an unarmed black motorist who was shot and killed as he was attempting to flee from a 2015 traffic stop, the Associated Press reports. According to a 13-page plea agreement, obtained by AP, state prosecutors are also dropping a pending murder charge against Slager in a move that will basically bring an end to the federal and state cases against the former officer. Slager, 35, was set to make a federal court appearance Tuesday for motions related to his federal trial, which was planned for later this month. Scott’s shooting sparked outrage after bystander video captured Slager shooting at the fleeing 50-year-old, firing eight shots and hitting Scott five times in the back. Last year, Slager’s state murder trial ended in a hung jury, and state prosecutors planned to retry him later this year. However, the deal that drops the remaining federal charges against Slager also tosses out the pending murder charge. 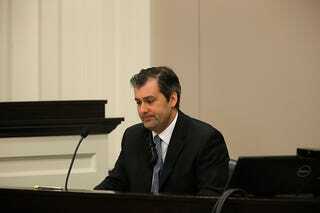 Slager, however, could still face a life sentence when he is sentenced by a federal judge, AP notes. Read more at Talking Points Memo.